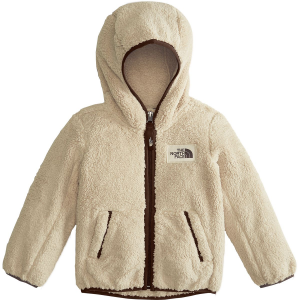 When the nights get extra-chilly at the campsite this summer, make sure your little adventurer is wrapped up in the cozy comfort of The North Face Toddler Boys' Campshire Full-Zip Fleece Jacket. Ultra-warm and soft, this midweight fleece jacket is crafted from high-pile Sherpa fleece for a toasty fit and feel that'll keep him exploring in comfort, even after you've called it a day. Plus, the elastic-bound hood and cuffs provide a snug fit that blocks out chilly gusts, while welt hand pockets warm up cold fingers or stash snacks.